With Hako you save water and detergent. Hako offers you made-to-measure dosage and filling systems, speed-dependent control of the amount of water and, in addition, the Hako Aqua Control Brush System on all automatic scrubbers. This enables you to eliminate inaccurate dosage completely, prevent too much water being used and save up to 50% of water and detergent when cleaning. Download our patented Aqua Control Brush System brochure today to find out more. 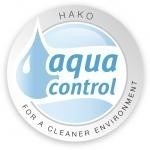 To find out how Aqua Control Brushes form part of Hako’s Integrated Environmental Cleaning™ system, check out the below video.